United’s Mileage Plus just announced a conversion bonus of up to 30% for hotel points transferred to miles. This offer is valid between October 26 and November 30, 2012, and requires registration. The bonus is dependent on number of miles transferred in and is capped at 50K miles that will yield 15K bonus miles. You can transfer hotel points on number of programs. United will tally the total number of points transferred in and will then calculate the bonus. The maximum number of bonus miles you can earn is capped at 15K. Doesn’t make too much sense to convert Marriott points to United Miles. You are better off by going the Marriott Travel Package route. For 270K Marriott Rewards points you would not only get 120K United Miles but also 7 days at category 1 to 5 Marriott property. You would only get 1 per 10 Hilton HHonors points. You would need to transfer 500000 Hilton Points that would be enough for two weeks at the Hilton Bora Bora to get 65K United miles after the bonus. It is relatively easy to earn Priority Club points. 250K Priority Club points would transfer to 65K United Miles after the bonus that is fair. Most of the other airlines would give you 25K miles for every 20K transferred, but United is 2 Starpoints per 1 miles. Transferring Starpoints to United miles make no sense at all. This is the only program that I don’t have an opinion of whether it makes sense or not to transfer to United. Earlier in the year, I transferred all my Wyndham points to AA. 128K Wyndham points would convert to 66200 United miles after 15K bonus that is ok. The best time to convert hotel points to miles is when the airlines are offering transfer bonuses. But even then you should always figure out if it makes sense. I have tried to lay out above what makes sense and what doesn’t. Eligibility: Offer valid only for MileagePlus® members residing in the United States. Registration: To qualify for this offer, members must register for the promotion between October 26, 2012 and November 30, 2012 (“Promotional Period”). Qualifying Activity: A member must earn a combined minimum of 5,000 award miles as a result of one or more points to miles conversion transactions from any combination of MileagePlus hotel partner programs that are conducted during the Promotional Period (“Qualifying Activity”) in order to qualify for MileagePlus Hotel Points-to-Miles bonus miles. or 15,000 bonus miles will be deposited when Award Miles earned from cumulative Qualifying Activity is 50,000 or greater. No bonus miles will be awarded if total Award Miles earned by such member from hotel points converted during the Promotional Period is less than 5,000. The maximum bonus miles that can be earned by a member under this promotion is 15,000. MileagePlus will not be responsible for technical problems with partner miles postings, or failures or delays in miles postings by hotel partners, that would render any points to miles converted as ineligible under this promotion. General: This offer is not combinable with other MileagePlus offers. Offer subject to change without notice. Other restrictions may apply. Miles accrued, awards, and benefits issued are subject to change and are subject to the rules of the United MileagePlus program. Please allow 6-8 weeks for miles to post to your account. United may change the MileagePlus program including, but not limited to, rules, regulations, travel awards and special offers or terminate the MileagePlus program at any time and without notice. Bonus award miles, award miles and any other miles earned through non-flight activity do not count or qualify for Premier® status unless expressly stated otherwise. United and its subsidiaries, affiliates and agents are not responsible for any products and services of other participating companies and partners. Taxes and fees related to award travel are the responsibility of the member. The accumulation of mileage or Premier status does not entitle members to any vested rights with respect to the program. United and MileagePlus are registered service marks. For complete details about the MileagePlus program, go to www.united.com. Marriott is offering a complimentary Silver status on their Marriott Rewards programs for number of corporate and educational customers. Normally the entry level silver status requires 10 nights. Last year, Marriott gave this Silver status for signing up to their program in the Asia Pacific region. This offer is available for IBM, Siemens, Cisco, Accenture, Chevron, AT&T, Verizon, PepsiCo, Citigroup, Bank of America, Comcast, HSBC, and numerous others. There is relatively easy way to get either Gold or Platinum status by doing a Taste of Gold or Taste of Platinum challenge. You can read more about both here. 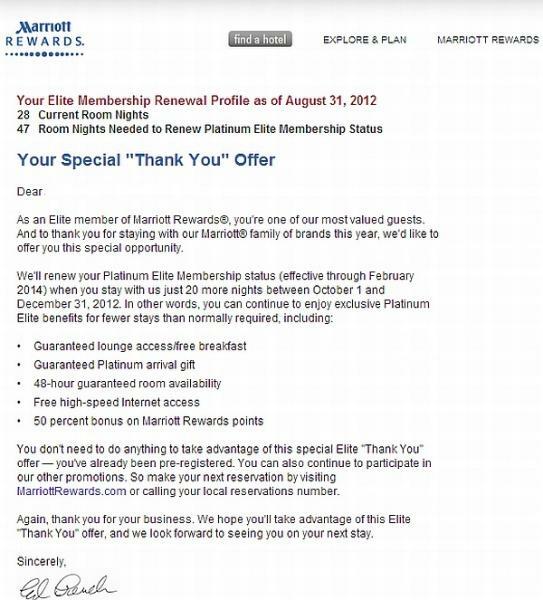 Having an entry level elite status with Marriott can come handy. If you are planning to have more Marriott stays, I would suggest that take advantage of the Gold or Platinum challenge that I referenced above. The owner of Eden Roc hotel attempted to take over the hotel on October 14 in a hostile manner according to the Bloomberg. The owner of the hotel sued Marriott back in April for mismanaging the property. The hostile takeover didn’t go to the plan and Marriott is still managing the hotel and have counter sued the owner. Obviously the owner has a final say at some point and I wouldn’t be surprised if this hotel would disappear from Marriott’s portfolio sooner rather than later. I have never considered Marriott to be a very successful company when it comes to desirable lifestyle brands. They are very good at managing your cookie cutter business hotels by providing uniform service. Their recent launch of the Edition brand has not gone to the plan. The owner of Waikiki Edition took over the hotel on a manner in which the Eden Roc owner failed back in August 2011. Marriott often has airline related bonuses for gift card purchases. Now, Marriott is offering up to 5000 Unites Airlines Mileage Plus miles for buying a $1K Marriott gift card. This offer is valid until November 26, 2012. You can access this offer here. You are buying this gift card directly from Marriott. If you are using your Marriott affiliated Chase card to pay for the purchase, it counts as a Marriott purchase. When you use these gift cards to pay at the property, you first guarantee your stay using a credit card. Then, when you are checking out, you just tell the front desk that you prefer to settle the account using the gift card. This is easy 5000 bonus United miles, if you stay at Marriott hotels. Normally during the holiday season Marriott has an offer of 10% discount off the face value for gift card purchases ($1K card for $900) or 10% bonus on top of the purchase amount ($1100 gift card for $1K). Marriott GiftCards, purchased in $150 earn 500 bonus miles, $250 earn 1,000 bonus miles or $400 earn 2,000 bonus miles allowing a maximum of 5,000 bonus miles to be awarded per member during the promotional period. United MileagePlus member number will be awarded the bonus miles, regardless of purchaser. Cannot be combined with any other offer or promotion. This is an online promotion only and not valid on Marriott GiftCards purchased on property, via 3rd parties or 1 800 813 GIFT. Shipping and handling fees apply. Promotion is valid October 15 through November 26, 2012 only. The Marriott GiftCard can be used for all purchases and services charged to a Marriott guest room folio. The Marriott Gift Card cannot be used to guarantee a room reservation, but may be used as payment at check out. If you are not a registered hotel guest and are planning to use this card at a spa, restaurant, retail store, or other outlet, please confirm in advance that the Marriott GiftCard is accepted. Gift Card purchases earning United MileagePlus are not eligible for return or refund. GiftCards purchased with this promotion are not eligible to earn Marriott Rewards points. While supplies last. Terms and Conditions are subject to change without notice. All MileagePlus rules and regulations apply. All Marriott Rewards rules and regulations apply. Taxes and fees related to award travel are the responsibility of the member. The accumulation of mileage or Premier® status does not entitle members to any vested rights with respect to the program. United and MileagePlus are registered service marks. For complete details about the MileagePlus program, go to www.united.com. Usually transferring points between competing programs through a third party is a losing proposition. There is, however, a workaround for transferring Marriott Rewards points to Hilton HHonors at competitive rate by going through the Travel Package route. You can read more about Marriott Travel Packages here. You can redeem a Marriott Travel Package that comes from 50K to 120K Virgin Atlantic miles. For example the category 1 to 5 Travel Package costs 270K Marriott Rewards points if you choose 120K Virgin Atlantic Flying Club miles option. After the miles have shown up on Virgin Atlantic, you can transfer them to Hilton HHonors at the rate of TWO Hilton HHonors points per ONE mile. Your 120K Virgin Atlantic Flying Club miles just turned to 240K Hilton HHonors points. Hilton has properties in many locations that are desirable and rather expensive by paying. Marriott doesn’t have properties in French Polynesia, Maldives, Bali (Courtyard doesn’t count although I have stayed there), Seychelles etc. Also, best value Hilton HHonors award redemptions are at these locations. What you can do with 240K Hilton HHonors points? Hilton HHonors offers VIP awards for Gold & Diamond members and it is very easy to get Gold status. Here’s an example for staying 6 nights at the Conrad or Hilton in the Maldives. Six nights stay using points costs 225K Hilton HHonors points. You can also use Hilton HHonors points in Moorea and Bora Bora in French Polynesia at the same 37500 points per night when you book a six night stay. Hilton HHonors has a very nice Conrad property in Bali where I have been several time. It is far better than the nearby only Marriott property on the island the Courtyard. The Conrad is only 26250 points per night if you do a six nights stay. Total of 157500 points for six nights stay. Seychelles properties are both at the 37500 level for 6 nights stay also. Total of 225K for a nice stay. Hilton’s Gold status is comparable to Marriott’s Gold, but includes a complimentary breakfast even at resort properties. If you are planning to do a swap for Hilton points, you should at least arrange a Hilton Gold status. There are quite a few shortcuts to it. Hilton offers instant Gold status for Visa Infinite card holders in Asia. You need to move your address to Asia and find usable Visa Infinite number to apply for the account upgrade. Other option is to do a Gold via MVP program for just four stays. Hilton also emailed an instant Gold offer for number of different airline program elites. I have written a piece how to do a “traditional” Hilton HHonors Gold/Diamond status match. 5. Consider doing one of the Gold status match/fast track options above. If you want to stretch your Marriott Rewards points to the fullest, you should always redeem for travel packages. Also, this transfer option via Virgin Atlantic is fantastic for those aspirational Hilton properties in locations where Marriott is nonexistent. Marriott Rewards has a free night offer for new members that join Marriott Rewards and have a paid stay at any of the participating hotels in Europe after signing up. You need to join Marriott Rewards using this link and have your first stay between October 15 and January 15, 2013. There is a similar offer for new members that sign up in Asia-Pacific as well. Please note that this offer was sent to Hertz Gold Club members. I don’t see how they could track the sign ups as the link to join is not personalized. Free night certificate after one paid stay, is a very good sign up offer. Marriott also has a current MegaBonus offer for bonus points or free night certificates after every two paid stays. If you are considering having more Marriott stays, you can contact Marriott and request taste of Gold or Platinum challenge. This is very good offer for trying out Marriott. Remember that you need to have the first stay after signing up in Europe to be eligible for the free night certificate. This offer is valid only for a specific audience of Hertz Gold Club members who reside in Europe. Only those who receive this promotion directly may participate. Hertz Gold Club members who enrol in the Marriott Rewards programme will earn one free night certificate at a Marriott Category 1-4 hotel after completing one paid stay between 15 October 2012 and 15 January 2013 at a participating Marriott hotel in Armenia, Austria, Azerbaijan, Belgium, Czech Republic, Denmark, France, Georgia, Germany, Greece, Hungary, Ireland, Israel, Italy, Kazakhstan, Netherlands, Poland, Portugal, Romania, Russia, Spain, Sweden, Switzerland, Turkey or the United Kingdom. The Free Night certificate is valid at more than 2,800 Category 1-4 hotels. For a listing of Category 1-4 hotels, please visit Marriott.com/rewards/use-points.mi. Stays at our exclusive luxury hotel partner, The Ritz-Carlton,® will count towards achievement. You may use additional Marriott Rewards points to upgrade your room type, subject to availability. Certificate will be automatically deposited into your Marriott Rewards online account 3-5 days after making one paid stay. Please note that this is an electronic certificate; therefore, a paper certificate will not be issued. Certificate is valid only in connection with individual travel and is not applicable to group travel, package tours, conventions or other special rates and/or package programmes. Certificate may not be used to pay for food, beverages, service charges, other taxes or other incidental expenses. You will not earn Marriott Rewards points or airline miles for room charges or room tax covered by the Certificate. Nights spent while redeeming an award do not count towards Elite-level membership. Certificate is good for one night and for one room only. Certificate must be redeemed within six months from the date of issue. Certificate cannot be extended past expiration date or re-credited for Marriott Rewards points or air miles. Certificate is non-transferable and has no cash value. All reservations are subject to Marriott Rewards redemption availability. You can also make reservations by calling 44 20 7012 7312 from the United Kingdom; 0699 508 6492 from Germany and +971 4 217 3579 from Dubai, UAE. What would be better than getting cashback rebates for travel related bookings that you would be taking regardless? Sounds too good to be true? Actually, it is not. You are really leaving money on the table if you are not taking advantage of various cashback options for hotel stays and airline bookings. These are my personal choice as you normally get the cashback deposited directly to your PayPal account. It is easy to compare the cashback options because the payout is represented in percentage of the price. You just choose the cashback mall that is offering the highest payout at the time you do the booking/purchase. My favorites on this category are FatCash, BigCrumbs, eBates, MrRebates, TopCashback, Quidco & Upromise. There are number of others as well. There are few hotel chains like Hilton and Marriott that are offering a cashback mall where most of the major US airlines like Delta, United, American, and US Airways (and pretty much all the others) do have one. These tend to be run by Cartera. I normally only use these when they are offering a bonus for a bonus miles for hitting a certain thresholds. These are normally offered during the holidays and back to school periods. Credit card companies and banks have opened their own cashback malls as well. Citi, Chase, Discover, Bank of America etc. all have their own cashback malls. I used Citi’s Thank You Points-mall a lot when they were offering fixed price air awards. Now that the payout is only 1.33 cents per point on air fare, it hasn’t been that competitive. You can always just go through one provider or follow my advice and just open an account with all of them. You should then the cashback mall that offers the highest payout. The cashback amount varies vendor to vendor and can change sometimes weekly. There are various sites for checking out the cashback amounts. You can visit Evreward, RewardsDB, CashbackHolic, CashbackMonitor and NerdWallet. The latter is specialized for the credit card and bank cashback malls. None of these is perfect, however. You should always check UK based Quidco as well that has offered very good cashback rates as of late and is excluded from most of these comparison sites due to its location. There are sometimes problem with tracking the cashback from making the booking to getting the payout. I have made a simple Excel sheet that I use for this purpose. I record the date of the booking, the date of the stay (in case of hotels), the name of the merchant, name of the cashback mall, the confirmation number, and the expected cashback amount or percentage of rebate. It is really essential that you do this if you make number of bookings as it might get confusing really fast which mall you used and when. Also, the cashback amount/percentage can change. It is essential that you have recorded the amount that you should get based on the cashback rate at the time of booking/purchase. The de facto payment form for the first set of sites is PayPal. Some sites pay out quarterly, some monthly, some require you to request a payment before it is processed and some may require you to have a minimum withdrawal amount of $10. The airline/hotel related malls just deposit the miles/points that you have earned from your purchases to your account. The same goes for bank/credit card related ones as well. The cashback amount on IHG group of hotels varies a lot between the sites. I have come to realize that I really need to check them all when I am making bookings. The booking was made using the cashback link on Quidco’s website. Hotels tend to offer attractive cashback rates as they are trying to get more bookings through their websites and not having to pay 10% travel agent commissions. I have earned thousands of dollars cashback through these sites over the past ten years I have been using them. It doesn’t matter if you are not located in the United States as these sites are paying out to PayPal account. Similarly, nothing prevents you taking advantage of sometimes generous rates that Quidco, based in the UK, is offering. Note that LoyaltyLobby may get a referral fee if you join and use the cashback sites mentioned above. This is a new feature that I will do monthly after I have done the updated hotel promotions post. I will have a post about hotel promotions that I will take advantage of. – This is an excellent promo for free night certificates. Only drawback is the categories where they can be used (category 1 to 4). Very useful in the Asia/Middle East but not so in the Americas. – Hilton apparently doesn’t have Hilton HHonors point promotion for this month, but you can make your own by taking advantage of this Virgin Atlantic one. If you have FIVE stays at Hilton HHonors properties (no Hampton Inn, Homewood Suites, or Home2 Suites), you will receive 15000 bonus Virgin Atlantic Flying Club miles in addition to 5000 base miles. You can transfer Virgin Atlantic Flying Club miles then to Hilton HHonors points and you will receive 40000 Hilton points for 20000 miles. – There are number of promotions that you can always take advantage of. Some of these “unpublished” but I have listed them all here on LoyaltyLobby. I will do the Q4 stay promo combined with the Roles to Rooms. With other bonuses, I will earn in excess of 50K Priority Club points for 7 stays. You can do even better if you start with a “fresh” account. You can actually combine all these promotions. The Better By The Night is lackluster but ok when you make the hotel booking using SPG’s iPhone app for 500 extra points per stay. You can combine these two with the Aeroplan bonus of 5K miles for 5 stays. You can get a free night award just for staying for a night by December 31, 2012 at any Radisson/Radisson Blu property in the United States, Canada, and the Caribbean. The free night award is valid until December 31, 2013. It appears first that there are no truly outstanding promotions out there, but these four are definitely worth taking advantage of. Here our monthly blog post about hotel loyalty promotions. You can now find an updated list just by clicking the “Hotel Promotions” tab. This will be updated throughout the month when promotions expire and new ones are announced. Le Club Accorhotels is offering bonus miles for Air Canada Aeroplan, Delta SkyMiles, and Lufthansa Miles & More members until October 31, 2012. You can get instant Platinum status with Le Club Accorhotels just by signing up to the program. Best Western’s fall promotion for double/triple points is starting on September 23rd and ends on November 18th, 2012. You can read more about this promo by following the link. You can get a free night voucher for every two night stay at the Country Inns & Suites locations in the United States and Canada. This offer is valid from October 1 to November 30, 2012. You can get triple points + 2000 bonus points by booking a breakfast package. This promotion is valid until December 31st, 2012 at selected Radisson & Radisson Blu locations. 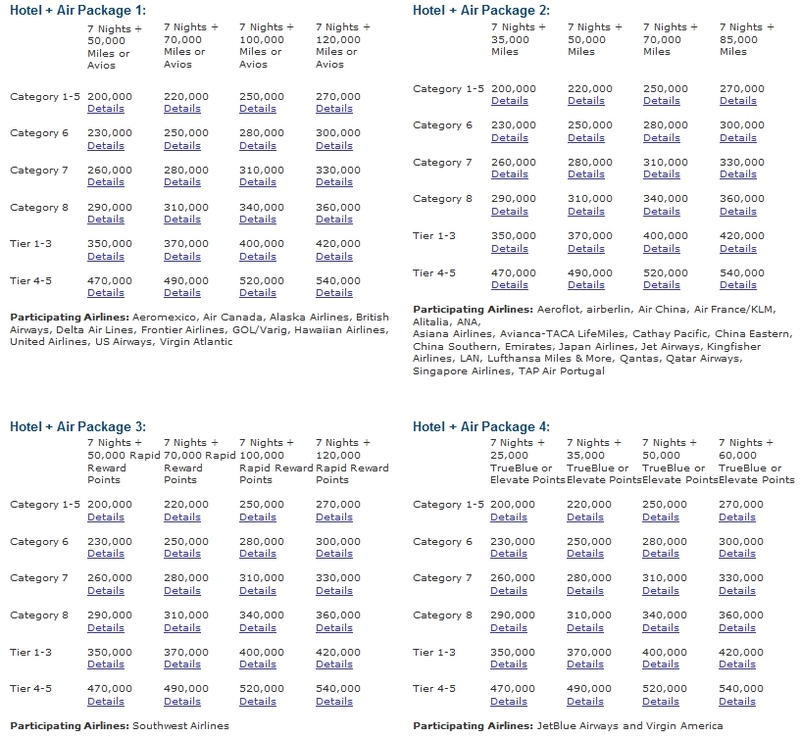 You can get triple American Airline miles (1500) for Radisson/Radisson Blu stays worldwide until December 20th, 2012. Club Carlson is celebrating 25 years of Country Inn & Suites by giving 25K bonus points for two night stays until October 14, 2012. There is an elite offer for 2 for 1 and 4 for 2. You need to be a Gold or Concierge member to take advantage of these discounts that are valid in Europe, Middle East Africa. Choice’s fall 2012 promotion is valid until November 14th, 2012. You will earn at the minimum 8000 points for every two stays. Hilton has a special “Be Yourself” package for Conrad resorts. Gold/Diamond members will receive 5000 bonus points per stay. Hilton is offering instant Gold status until 2014 and bonus points/miles for American, Delta, JetBlu, United, US Airways, and Virgin American frequent fliers. This offer is targeted. You can get free 500 Hilton HHonors points for liking Hampton Inn on Facebook. 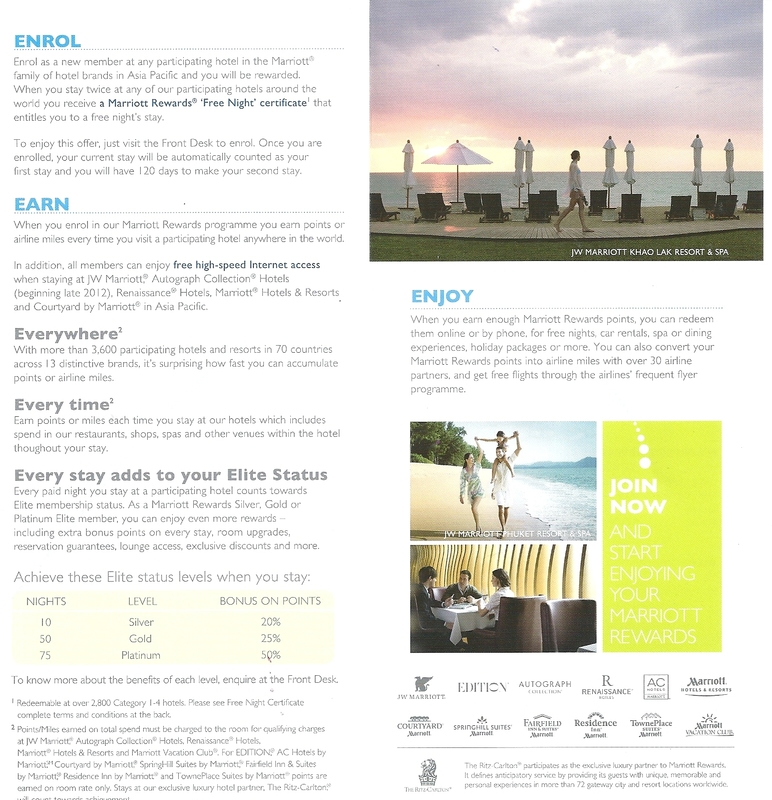 Hyatt’s fall 2012 promotion is valid from September 1st to November 30th, 2012. You will earn 5000 bonus points after 5 nights and 10000 bonus points for every additional five nights for maximum bonus of 65000 Hyatt Gold Passport points. 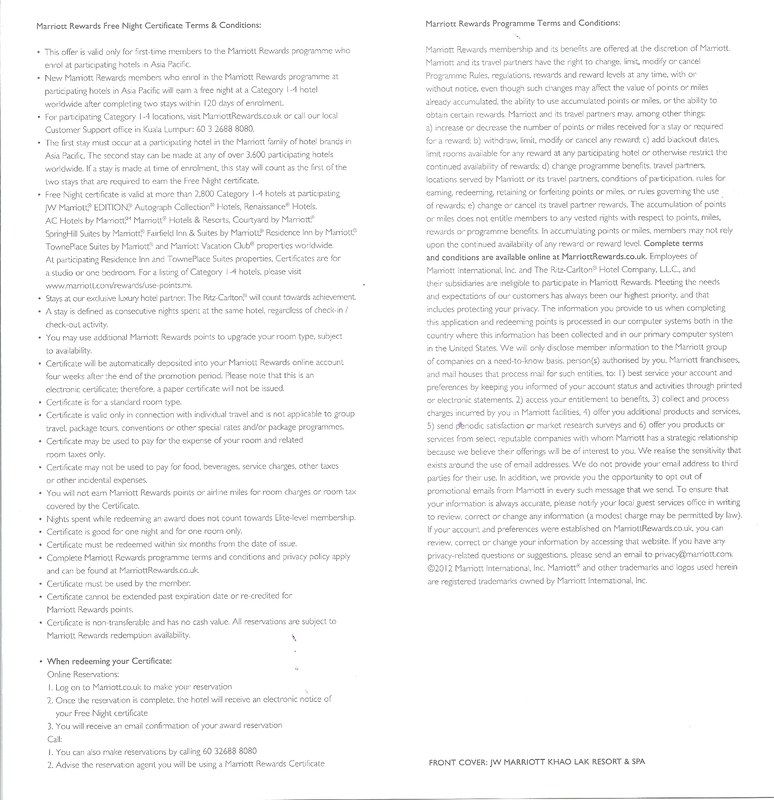 The beauty of Priority Club is the onslaught of ongoing overlapping promotions that you can triple/quadruple dip.You can read about my average Priority Club point earnings when all the promotions are factored in here. I have also written about different type of Priority Club promotions here and what you can expect to earn for your first stay if you sign up for an account here. These are valid from October 1st to December 31st, 2012. You should sign up for 5K, 10K or 15K varation of this offer depending how many IHg nights you are planning to have on the 4th quarter. Marriott has their usual fall MegaBonus starting on September 15th and ends on January 15th 2013. You need, however, register for the promotion by October 31st, 2012. You can earn triple airline miles tarting on your second stay on Marriott’s MegaMiles promotion that ends on October 30th, 2012. You can get Southwest Rapid Rewards points for Marriott Gift card purchases. If you haven’t been targeted to any of the promotions or you would like to change to another one, you can follow the instructions to get the promotion fixed for you. Ritz-Carlton has an offer for 30K bonus points for a stay of four nights or longer. This offer is valid until October 15th, 2012. Starwood’s next promotion Better By The Night begins on October 1st and ends on December 20th, 2012. You will receive double Starpoints for stays of 1 to 2 nights and triple points for stays of 3 nights or longer. You can get 500 bonus points for booking made on the iPhone SPG app or 250 points for bookings made on spg.com. Starwood has a promotion with Air Canada’s Aeroplan for maximum of 8000 bonus miles. This is in addition to the Starpoints that you earn. Promotion is valid from September 10 to December 9, 2012. Westin Kierland and Sheraton Wilde Horse Pass have exciting bonus points opportunity. Stay once at both properties and earn 10000 bonus Starpoints. You can get 1000 Delta SkyMiles or US Airways Dividend Miles for booking a special (expensive) rate plan. Wyndham’s autumn promotion is extra points or miles for second and fourth stay before November 30, 2012. Every September Marriott emails out a specialized offer for those Platinum members that are not meeting the requalification requirement of 75 nights. These emails went out again this week. The offer is typically a requirement of 20 nights between the October 1 and December 31 to renew the Platinum status regardless of the number of nights stayed earlier in the year. 1. You can buy back the Platinum status next year for 50K Marriott Rewards points. You can do it yearly. 2. You can do a Marriott Platinum status challenge in 2013 and have the Platinum status to be valid until 2015. You only need 9 stays within 3 months period + the month you sign up. It might be time to consider if you really need the Platinum status? The Gold status gives pretty much the same core benefits i.e. complimentary internet and club access as the Platinum status. I would probably wait and see if the Marriott would extend the Platinum status without having to put up any unnecessary night. Then, next year, if they didn’t extend the Platinum status, you could buy back the status or do the challenge. Marriott has had a membership drive in the Asia Pacific region already for more than a year. They had a similar offer in 2011 as well for a free night certificate. They have the same offer going on right now as well. Note that internet access is complimentary regardless of status if you are just member of Marriott Rewards in Asia Pacific region. To be eligible for this offer you need to sign up for the Marriott rewards at the hotel in the Asia Pacific. You need to have the second stay within 120 days after joining. The free night certificate will be deposited to your Marriott rewards account. 1. Sign up for the Marriott Rewards program at the check in & be eligible for the free night certificate after two stays. 2. Sign up for the free night certificate after two stays for up to three certificates promotion. This is the current global promotion. 3. Request Gold or Platinum challenge from Marriott. You can get Gold status until 2014 after 6 stays or Platinum after 9 stays. Enjoy your four free night certificates at category 1 to 4 Marriott Rewards hotels. Marriott has been very predictable as of late with their promotions. I do like their free night certificates after two stays version of the promotion. If you are not yet a Marriott Rewards member, you can sign up in the Asia Pacific during your first stay and get signed up for the new member promo as well. Hertz has launched a promotion for up to 5000 Marriott Rewards points per rental of five days or longer. Shorter rentals of more than two days are eligible for 2000 Marriott Rewards points. This offer is valid for pick up until December 31, 2012, in the United States, Canada, Mexico, Europe, and the Puerto Rico. These car rental promotions are always tricky. I normally rent using rates that are only eligible for points on Hertz’s own rewards programs and not eligible for the miles. You should check if you can save with this offer over regular discount rates and take the Marriott points into equation as well. Normally, you could use other discount plans as well as long as you include the coupon number (PC#) associated with this promotion. This is a good offer if it doesn’t inflate the rates over regular discount rates. The offer promises a 35% discount using the CDP associated with this Marriott offer but that is often not the case. Terms and Conditions: Advance reservation required. CDP 154080, PC# 169680 and Marriott Rewards number must be included in the reservation. Modifying your reservation may result in a change in your rate and/or invalidate this offer. This offer has no cash value, may not be used with Pre-Pay Rates, Tour Rates or Insurance Replacement Rates and cannot be combined with any other certificate, voucher, offer or promotion. Offer valid at participating airport and off airport locations in the U.S., Canada, Europe, Mexico and Puerto Rico. Hertz age, driver, credit and qualifying rate restrictions for the renting location apply. Taxes, tax reimbursement, age differential charges, fees and optional service charges, such as refueling, are not included. The CDP savings of up to 35% applies to time and mileage charges only; discounts vary by rental date, location and vehicle type. Points will not be awarded on travel industry rates, wholesale tour packages, insurance/dealer replacement, other promotional rates or group travel. Offer valid for pickup through 12/31/12. All Marriott Rewards program terms and conditions apply.